WiBotic transmitters (TRs) convert incoming AC power to a high frequency wireless power signal for transmission to Onboard Chargers. 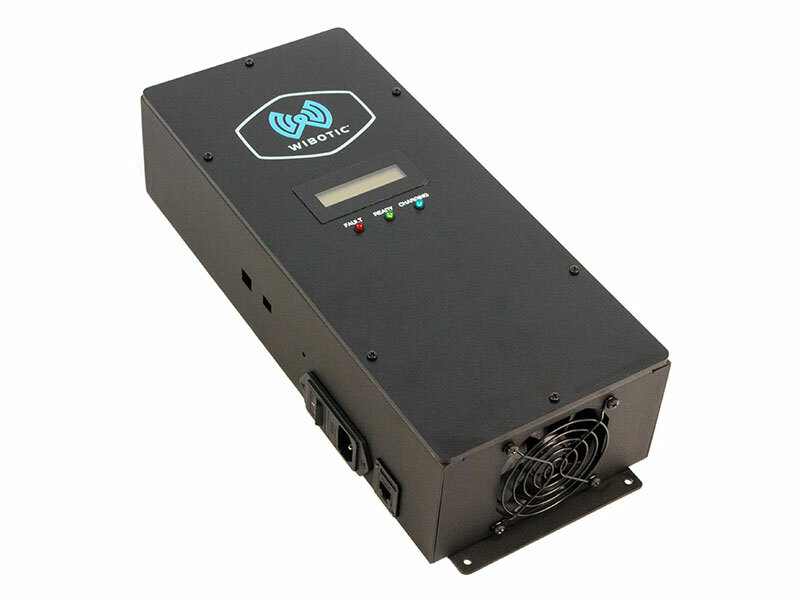 The TR-110 is WiBotic’s Transmitter for applications requiring up to 125W of power delivered to the battery or load. Ideal for lower-power mobile robot and drone applications, it can be installed in the WiBotic PowerPad or in any third party landing pad or drone hangar. Shipped in a standard powder coated metal enclosure, the TR-110 also has flanges for easy wall mounting, an LCD display for system messages, and LED indicator lights to show system status at all times. The standard TC-200 transmitter antenna attaches via a short coaxial cable, and a built-in Ethernet port allows external systems to monitor and control the transmitter using WiBotic’s Windows or Linux GUI or the WiBotic API. The TR-110 currently supports the OC-110 and OC-210 Onboard Chargers.